THE TEAM AT WORK — Kendrick Morales, left, and Alexander Passofaro, right, work together to transition the software for the Aeronautics AR app. WHAT I LEARNED — Kendrick Morales recently returned from a trip to Galveston, Texas, where he performed a beta test of the Aeronautics AR app at the Space Center Houston Quiet Supersonic Flights (QSF) exhibit. He displayed the app to people of all different ages to gauge their reactions and listen to feedback. If you have ever dreamt of having a NASA aircraft in your living room, then you are in luck. Kendrick Morales, a fall intern at NASA’s Armstrong Flight Research Center, has worked for the past few months continuing the development of an augmented reality app that will allow users to digitally materialize a NASA aircraft on any flat surface they choose. Augmented reality, or AR, is the overlaying of a digital environment on the real world. Using the mobile phone’s camera pointed at a flat surface, this new AR app displays 3D. The app, named Aeronautics AR, will feature AR versions of the X-59 QueSST, X-57 Maxwell and NASA’s G-III Gulfstream jet. While looking at the 3D version of the aircraft, the viewer can read more information or follow a link to learn more online. NASA Armstrong spring 2018 intern Alexander Passofaro started the app development. He has since graduated from the University of Minnesota Duluth with a Management Information Systems degree. His work at Armstrong focused on his love for augmented reality, which he has taken with him to his new job, working with augmented reality at Lockheed Martin. “My favorite part of working with AR is the creative freedom I have with it,” said Passofaro. Passofaro worked on the overall design of the first phase of the app, which included a target image. A target image is a specific image that your camera can lock in to start the AR animation. After Passofaro’s internship ended, the center’s Office of STEM Engagement decided to continue on with his project. Kendrick Morales is a student at the University of Puerto Rico at Rio Piedras studying computer science. Morales continued Passofaro’s work while also putting his own spin on the concept. Morales worked with Passofaro to transition the software from being target image dependent to not using a target image at all. He used a trio of software: Unity, a video game de­sign­ing software; C # (or C sharp), a programming lan­guage; and Google ARCore SDK, a software development kit. Morales recently re­turned from a trip to Gal­ves­ton, Texas, where he per­formed a beta test of the app at the Space Center Houston Quiet Su­per­sonic Flights exhibit. He displayed the app for peop­le of all ages to gage their reactions and listen to feedback. He said many kids expressed interest and said the app was very fun. Passofaro previously did beta testing during his internship at the Los Angeles County Air Show and an AIAA Conference where feedback sparked the idea to remove the target imaging. 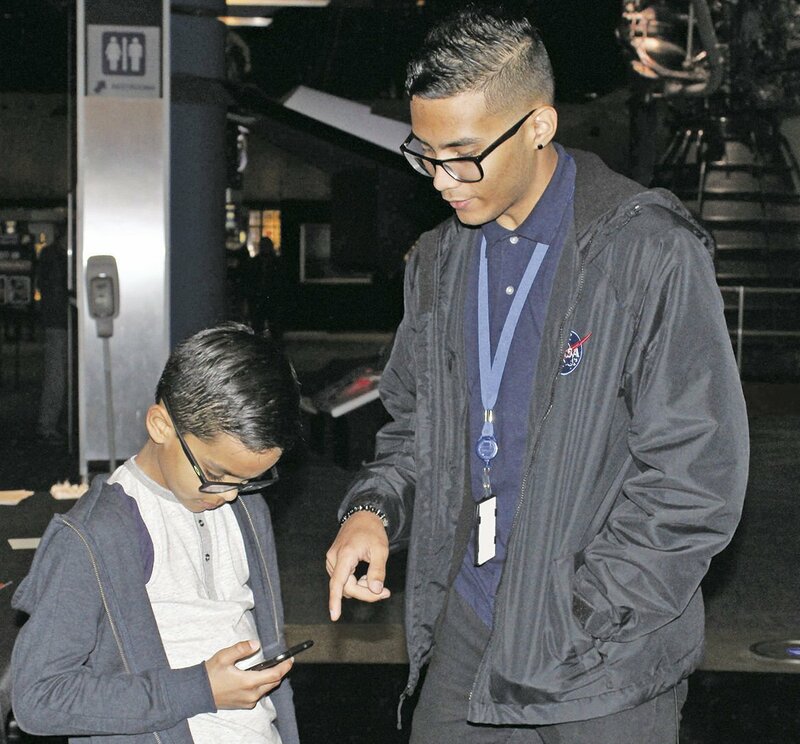 The app is made for mul­tiple age groups to enjoy learning about NASA’s X-planes and its aviation research pro­grams while also being entertaining. The app is available for Android devices. Morales said some future goals for the next intern is to make the app also available for iOS devices and integrate more aircraft into the app for exploring AR. The Aeronautics AR app is available for download in the NASA app store or Google’s Play store.